If you are looking for peace and quiet and lots of room to relax and play.Look no farther.We have only 8 sites with grass all around.Public playground right next door and Kingfisher Creek running by. 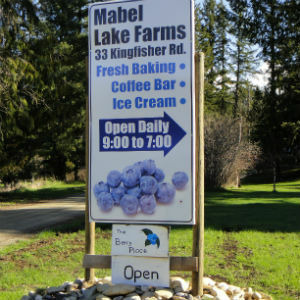 Its only a 10 minute walk to Mabel Lake for a swim or our favorite spot is just across the road in a beautiful back eddy on the Shuswap River.Mabel Lake Golf Course is only 2 minute drive away.There is amazing hiking along Kingfisher Creek or Shuswap River right out your camper door. We now accept online reservations. Visit https://mabellakefarms.letscamp.ca to Book Now!